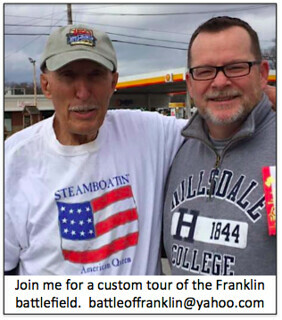 Hood’s frontal assault at Franklin in it’s historical context? Historian and author Eric Jacobson describes John Bell Hood’s frontal assault at Franklin in it’s historical context for the Civil War and at Franklin. I have recently updated the Google Map of the Battle of Franklin (easy reference: www.FranklinBattlefield.com). If you have learned hot to navigate using the Google Map tools (or are learning) I’m sure you have already found that Google Maps is a hidden treasure. I have spent hours upon hours working on the Google Map of the Battle of Franklin over the past few years. It is always a work in progress and is constantly being upgraded and improved based on feedback I get from readers and the more I learn. There are many new features and enhancements awaiting the diligent map-student. Click on any object to see what hidden features lie buried underneath. 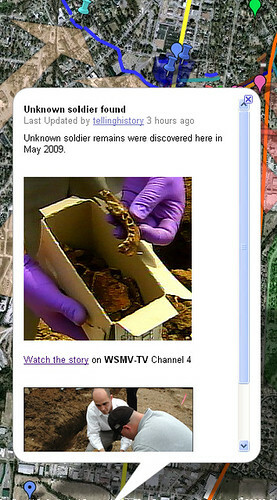 I’ve even added the location marker and info on the unknown soldier’s remains discovered in May. see how the troops deployed before clashing around the Carter House. watch embedded videos from expert historians describing the action from key points on the battlefield. Carnton is set to host the largest John Bell Hood exhibit in history! Carnton has gathered a variety of artifacts that once belonged to Hood.These items including his coat, hat, saddle, sword, and writing kitwill be on display at Carnton in the new Fleming Center. 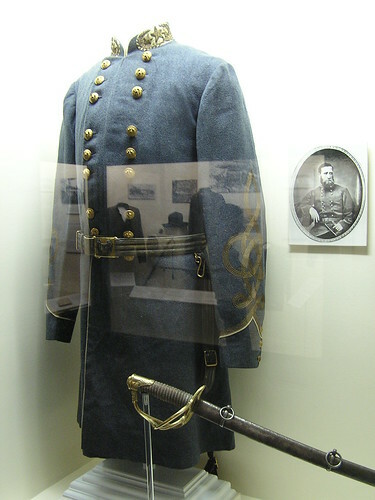 The exhibit entitled “Hood’s Legacy” willshowcase the items on loan to Carnton and provide information about the General’s life. Carnton Plantation will explore the man and his complete story, as well as his legacy. Well known in Middle Tennessee for the disastrous frontal assault of the earthworks at Franklin, Hood has a long and prestigious military career. 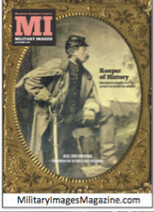 He graduated West Point class of 1853, and fought Indians in the southwestern United States prior to the Civil War. 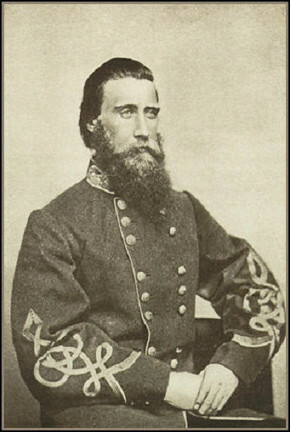 When the Civil War started in 1861, Hood resigned his position in the U.S. military and joined the Confederate cause. Hood served in the Army of Northern Virginia and fought under General Robert E. Lee. By the summer of 1864, Hood had been elevated to command of the Army of Tennessee. While the results of the Tennessee campaign in the fall of 1864 were devastating, Hood never wavered. His reputation as a brave and daring commander held true. Accompanying this exhibit will be a panel discussion about Hood. This discussion will be held in two sessions both beginning at 6 pm: Friday, November 6 and Saturday November 7. Topics to be covered include the early life, military career, Tennessee Campaign, and legacy of General Hood. Please join us for both the exhibit and the discussion about this controversial figure in Civil War history. And check out my recent interview with the Carnton collections manager about the Hood exhibit. What was the size of John Bell Hood’s Confederate Army of Tennessee when it arrived in middle Tennessee in late 1864? According to historian Eric Jacobson, the Army of Tennessee had 28,000 infantry and 5,000 cavalry when it arrived in middle Tennessee in late 1864. Hood took over the Army of Tennessee in July from Johnston. There were 8,000 Federals garrisoned at Nashville at the time. Hood would lose at least 7,500 at Franklin (30 Nov 1864) and another 6,600 at Nashville, two weeks later. When the Army of Tennessee retreated back to Pulaski in mid December 1864, the army was reduced to but a shadow of its former self. Hood was the fifth commander of the Army of Tennessee. He commanded the army from July 17, 1864, until January 15, 1865. Many historians say his recklessness destroyed the Army of Tennessee. In just six months (July 1864 – December 1864) Hood lost at least 30,000 men* at a time when the Confederate army, and especially the Army of Tennessee, was in desperate need of men. *Casualty estimates are based on the conservative figures as reported by the National Park Service. Here are the major engagements Hood was involved in from the time he became commander of the Army of Tennessee.